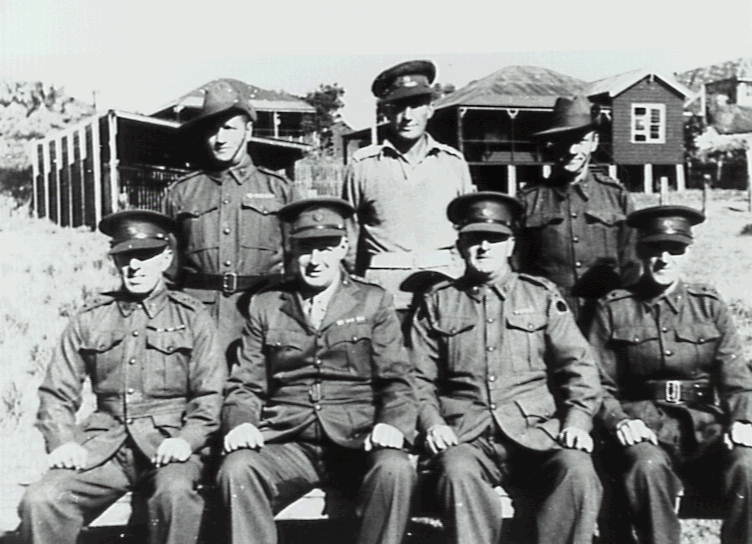 The 34th Battalion were regular users of the Bulli Rifle Range during the war year. The houses in the background are in Park Road. STRADDLING the banks of Slacky Creek, fronting ‘Sharkey Beach’ between Sandon and Waniora Points, the Bulli Rifle Range operated for over 70 years. Not long after the first mention of the range during December 1886, when the Bulli Rifle Club invited Wollongong marksmen to a shooting competition at its paddock, were concerns being raised over the range’s safety. Although the first media mention of the range was in 1886, more than likely it was operating as early as 1883 when publican, Dan Dudley established the Bulli Volunteer Corps. There were about 50 members of the Bulli corps, one of many formed across the colony during these times as a reserve army, and who practiced their shooting at local ranges. Bulli Rifle Club – At a meeting of the Bulli and Woonona Rifle Club on Wednesday night last at Orvad’s [Denmark] hotel, the captain, Mr. JD Walker, presided. The attendance was very good, and eight new members were enlisted. A letter was read from the military authorities, stating that 3,600 rounds of ammunition had been forwarded for musketry practice. Captain Paterson, who took a leading part in the formation of several corps in the Berrima district prior to his arrival here, was appointed delegate… A number of rules were formed for the guidance of the members in shooting, practice and contests. The corps has been permitted the use of the butts of the local battery of artillery by Captain MacCabe. The arms for the corps are expected within a week, and amongst them come a number of the improved type of rifle. When the men shall have become adept in the manipulation of the deadly weapon contests will be frequent, and the captain at present states that he will be pleased to receive trophies for matches. The Bulli and Woonona Rifle Corps have arranged for a contest in the skill of marksmanship to come off at the butts at the Point on Saturday next. Several valuable and encouraging prizes are offered, most of which have been presented to the corps for the purpose named. Mr. D’Arcy, of Bulli, has presented a Martini-Henri rifle, which is to be the reward of the highest scorer. A meeting of the members of the corps was to have been held last night to discuss whether the contest ought not to be postponed, as it had been represented that the Wesleyan Sunday School intend holding their annual picnic that day on the public park, which is in dangerous proximity to the rifle range. The Wesleyan Church have the prior claim, as that particular day has been set aside for the annual picnic for some time, and the same ground was always used. It was generally believed that the meeting would be a lively one, as some opposition to the proposed concession was expected, but, doubtless, reasonable counsels would prevail, and the matter of prize-shooting postponed to another day. 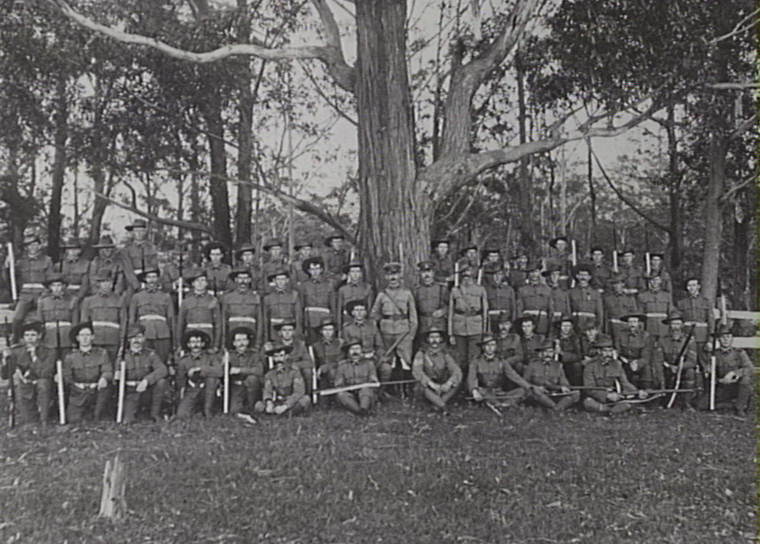 The Bulli and Woonona Rifle Corps disbanded in 1893 and reformed as a private company in January of the same year, continuing the use of government supplied rifles, and former officers. The new civilian club was named the Bulli and Woonona Rifle Club and they continued using the paddock, partly provided to them by wealthy landowner, and builder of the Bulli Family Hotel, George Croft and the Bulli Colliery. Another generous offer has been made by Mr. G. Croft, of Bulli — viz., a valuable allotment of land to the Bulli and Woonona Civilian Rifle Club, to be competed for by all corners. The allotment, which is valued at £30, has been accepted, and the entrance fee fixed at 7s 6d. As the 1890s drew to a close, the thought of having a rifle range in an area rapidly growing in population was causing further rumblings within the community. Besides being on land owned by George Croft, a large part of Bulli’s rifle range was also on land owned by George Adams, who also owned the nearby Bulli Colliery. It seems Adams was unhappy with his land be used as a rifle range and wanted the club to discontinue the practice. In a letter to the editor of the Illawarra Mercury, published on December 16 1899, the writer complained of the lack of patriotism of landowners refusing use of their land as rifle ranges. Sir, — At the present time, when things are looking sultry for our friends and neighbours in South Africa, who are engaged in a struggle to see who will rule the roost, it is interesting to note the contrast between the gold-bugs of Johannesburg and other parts of that country (who have raised and equipped at their own expense a regiment of cavalry 1000 strong) and some of our Bulli magnates. Would it be believed that not one of the land owners here would permit, even for payment, our local rifle men to have a shooting range on their ground? No; a few sheep or cattle are of more consequence than the training of our citizens in the use of arms, to defend if need be the same unworthy people. The Bulli and Woonona Rifle Club has been in existence now 11 or 12 years. During that time we have spent our time and money freely in perfecting ourselves not only in rifle-shooting but in training as reservists liable to be called on in time of war. The same with our friends in the artillery. Some may say it is really for pastime that we waste so much powder, but there is an element of usefulness in it too. It is high time that those who add field to field, and acre to acre, understood there are some duties attached to land-owning besides drawing rents and sticking up posters —’Trespassers beware,’ etc. “But,” they say, ‘we pay taxes for our defences.’ So do the landless. ‘But we pay a land-tax besides.’ Quite so, but is this adequate to the strike you have in the country? No. Every volunteer and rifleman in the country pays taxes and gives his services besides, and if war should break out we know who would got the bullets and who the billets. When a youth I was in the volunteers attached to the 79th Cameron Highlanders, and the neighbouring landholders were most generous in their support and encouragement to our corps. During an experience often years in our local club our most generous supporters have been our storekeepers and businessmen, and one landowner, to his credit — I refer to Mr. Geo. Croft. Hoping that a more patriotic spirit will be manifested in the future among those who, above all others, should encourage our young men in their learning to defend the country if need be. – DEFENCE, NOT DEFIANCE. Bulli, Dec. 12th. THIRROUL A meeting of the Bulli and Woonona Civilian Rifle Club was held on Tuesday night, at the Bulli Pass Hotel, Thirroul, being the first meeting for three months. Mr. J. P. Kirton acted as secretary, as Mr. T. Rixon was unavoidably absent. It was duly announced that there were 26 members on the roll. The following four new members were duly elected (bringing the total membership up to 30). The Thirroul Rifle Club is again in trouble over their range. Since the inauguration of the club they have used a range rented from Mr. G. McAuley. The erection of targets, mounds, etc., cost the club a considerable sum, and it seems unfortunate for so young a club to receive notice from the owner to remove their quarters. A deputation has waited on Mr. McAuley to try to induce that gentleman to co-consider his action, and it is to be hoped the deputation will be successful. The present situation of the range is the most convenient on the coast. The deputation seems to have bought the Thirroul club some time, but the writing was on the wall. The South Coast Times reported on March 3 1906 that the Thirroul club had received permission to form a company of the Seventh Regiment. However, by May 1906 interest was waning and the South Coast Times reported that the club was “practically dead”. The Sydney Morning Herald reported on November 4 1907 that the club had disbanded. The following year the Federal Government extended a lifeline to the Bulli Woonona – come Thirroul – Rifle Club. Just when members thought all hope of finding a rifle range had been dashed, the government stepped in and announced it would resume the old Bulli Rifle Range site, the property of the George Adams’ Estate. The resumption of the land, for a rifle range, would be a drawn out procedure with George Adams’ Estate, owners of Tattersall’s Lottery, demanding almost £11,000 for the 21 acre site. The Commonwealth Government’s estimate of the value of the land was just £700, and a lengthy legal battle ensued. The outstanding news this week is the result of the inter group rifle competition. The 12 Bn. put up a good show to win from the 33 Bn. last Sunday at Bulli Rifle Range. The 33rd Bn. was most unlucky, owing to some of their best shots having to work. Capt. Fowler, on behalf of the 33 En. took the result very sportingly and wished the 12th every success at the Anzac Rifle Range on 25/26th Nov. 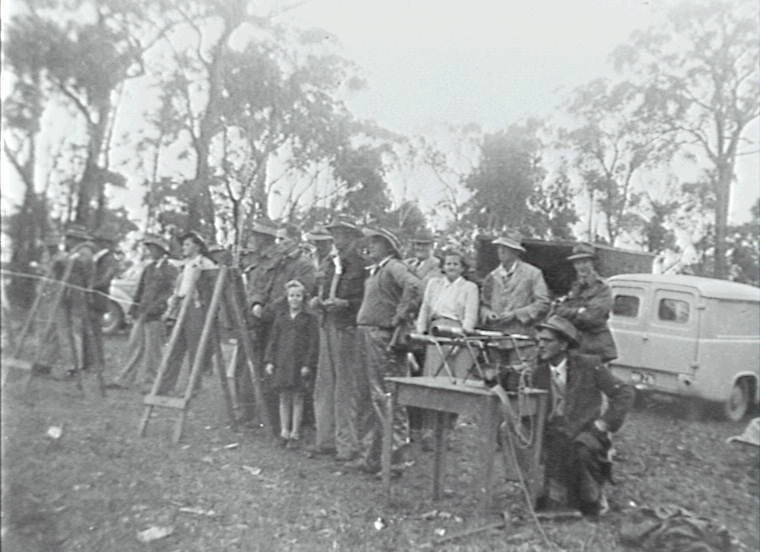 The Bulli Rifle Club was reformed in July 1946 after it disbanded during the war. By the late 1940s though, housing estates were sprouting-up on either side of the range. The Mercury reported on November 20 1947 that the committee of the rifle club had reported vandalism and theft from the range. As it is not the desire of this unit of the Defence Department to enforce any penalties, an appeal is made to parents to instruct their children against damaging equipment or in anyway trespassing, in the vicinity of such. Persons are warned of the danger from skipping bullets on the beach in rear of the stop butts, which is also a defence danger zone. A practice shoot was fired over 300 yards on Saturday last. A strong southerly wind combined with a mist from the sea, made shooting difficult. Every member present was pleased to see our ‘old timer,’ Bert Booth, take the badge for the best score off the barrel with an excellent 97. Sixty-five residents of Sandon Point, Bulli, have signed a petition protesting against closing of the right of way, in use by practice, across the Rifle Range at Sandon Point, Bulli. The petition will be sent today to the Minister for the Army (Mr. Francis), Mr. Davies, M.H.R., and the Commanding Officer, Eastern Command. Recently the Bulli Rifle Club erected two warning signs, indicating that anyone crossing the Rifle Range will be liable to a fine of £10. The Range is only used for shooting practice on Saturday afternoons, on rare occasions also on Sundays. The Club has wired off openings in the fence through which many people go to work to the railway station, Bulli shopping centre or Bulli Beach Roman Catholic children from Sandon Point cross the range to go to school in Park Rd. When the Bulli East public school, now in the course of construction, is completed many more children will have to cross the Range or otherwise make a detour around the beach (which is impassable after heavy rain) or a very big detour around the main road. In their petition, residents state that the Sandon Point area is rather isolated and the people living there have used the right of way across the range regularly for the past 15 years. Recently, it says, the Housing Commission developed a new settlement in the locality and to date has erected some 200 dwellings. Closing of this means of access will inflict considerable hardship for elderly people and children in that a much greater distance up a steep grade, will be necessary to reach public transport, the petition continues. “In the circumstances”, it concludes, “we desire to make representations for retention of the existing right of way. We suggest as an alternative that on those days when the range is in use, a club member or soldier, as the case might be, should be placed on each side of the range to obviate any danger”. Members of the Bulli Rifle Club near one of the club rooms on the site. This photograph was taken about where Hutton Avenue is today, looking north east towards Sandon Point in the 1940s. The Northern Zone Committee will ask the Federal Government to close the Bulli Rifle Range so that a new road can be constructed to link the newly developed Sandon Point area with Park Road Bulli. This was decided on Monday night, after a deputation from the Bulli- Woonona A.L.P. had told the Committee that the Range was both dangerous and obsolete. Twenty-one spectators throng-the public gallery at Bulli Council Chambers on Monday night, when the deputation met the Northern Zone aldermen. “A connecting road between the eastern end of Point Street and the township of Bulli is long overdue,” he continued. “These people have no shopping facilities and only one road to get in or out of the area, with the result that we have a very dangerous crossing at the corner of Point Street and Prince’s Highway”. “We realise the Rifle Range has been there for about 40 years, but we feel it has had its run.” he said. The new road is vitally necessary,” Mr. Bradbury concluded. Mr. Bradbury then handed the Northern Zone Chairman (Ald.Squires) a petition signed by 150 residents. Mr. Vince Woods, Vice President of the Bulli- Woonona A.L.P, said the Rifle Range was originally intended to train army recruits, but had now grown obsolete. “The present Point Street approach is a death trap, and a rifle range in the middle of a residential area is a danger hazard,” he contended. Mr. H. M. Sweeney, Mr. L. Simpson and Mr. R. Price supported Mr. Woods’ remarks. Ald. Jackson said that the deputation had made out an indisputable case. “A rifle range in an area like this is something that we just cannot tolerate,” he stated, “the danger as far as children are concerned is a very real one, for it would be easy for a fatal accident to occur. Ald. Williams said the necessity for the new road was quite apparent. The only thing wrong with Ald. Jackson’s motion was that it didn’t go far enough. He sought (and obtained) Ald Jackson’s permission to add the following rider: — “That we ask the responsible Federal Minister to close the Bulli Rifle Range.”The motion was then carried unanimously, the Chairman (Ald. Squires) adding the comment that the whole business made him wonder if some of our so-called experts had the foresight and brains they were supposed to have. He said he couldn’t understand this Housing Commission putting over a thousand people in an area where there was only one road in and out. By the mid 1950s the Bulli Rifle Range had closed. 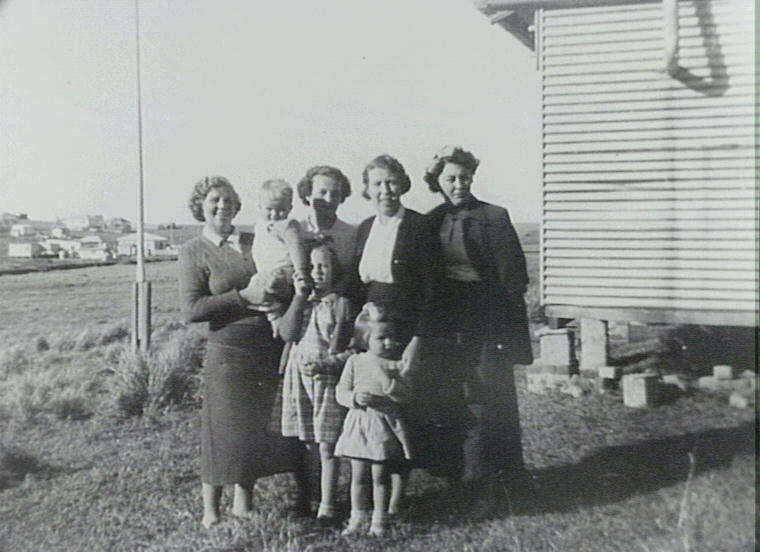 The site remained a paddock, owned by the Commonwealth Government and leased to locals to graze cattle for decades. Various proposals were put forward for the site, including a TAFE college however, the site was flood prone and was difficult to develop. In the 1980s and 90s part of the old rifle range, to the west of the site, between Hutton Avenue and Westmacott Parade, was developed as public housing. The remainder of the site today is open parkland.